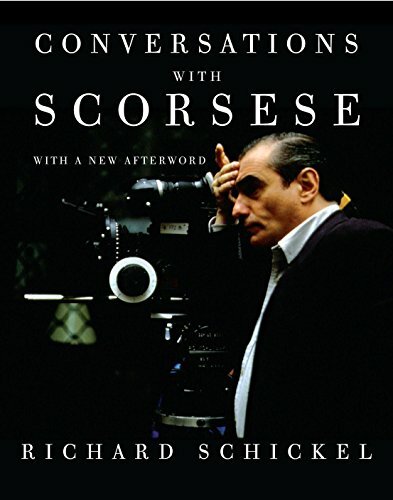 Richard Schickel’s Conversations with Scorsese is accurately named. It is a 448-page notebook filled with transcribed conversations. The author sits down with his old pal the filmmaker and they chat. The questions range from trivial to deeply serious, and the answers reveal the thoughts, insights, and techniques of one of the world’s great movie geniuses. In fact, both the author and his subject are simply at the top of their game. Then what’s wrong with picture? Simply stated: It is the intrusion of the author’s voice in a book that should focus on the subject: Martin Scorsese. The interviewer, a highly respected film critic and historian, is present on every page. He lets us know, several times and in several different ways, that he has a personal friendship with his subject—a man whom he refers to as “Marty.” Schickel’s frequent references to his own connection to Scorsese serve not as lenses through which to see and understand the interviewee, but rather as mirrors to reflect the presence of the interviewer. Interviewers often use the question-and-answer format for magazine articles. It’s simple: Print the question and then print the answer. Go on to the next question and the next answer. So it goes for an entire article. The problem here is that the format has been applied to a whole book. It begins to feel like an unedited transcript without drama. The result can be a strain on the eyes and rather jarring at the same time. There is a treasure trove of diamonds in the book—after all who wouldn’t want to eavesdrop on Martin Scorsese’s recounting of his personal struggles around the making of Raging Bull?—but the reader has to dig through a lot of verbal pebbles to find the precious stones. The same is true of the insights on subjects such as the controversies surrounding The Last Temptation of Christ and the deeper meanings of Shutter Island. Film buffs and historians will revel in the personal anecdotes and casually delivered remarks that reveal layers and layers of information about the artist Scorsese and his body of work. The rest of us may take the book on as a reference, but never as “a good read.” In fact, in an ideal world, the interview would have been issued as an audio book or even as a film such as My Dinner with Andre, in which the protagonists hold our attention as they chat about art and the world while dining together. The current book, as stated, has value. The author’s insistence on sharing the stage with his subject has diminished the value that the volume could have had. It’s indeed a conversation, but sometimes the chat gets in the way of the information.